Welcome to part two of our 1-Day Acuvue Define post! In this post, we will be talking about our fitting experience which J&J set us up with at EyeChamp at NEX. 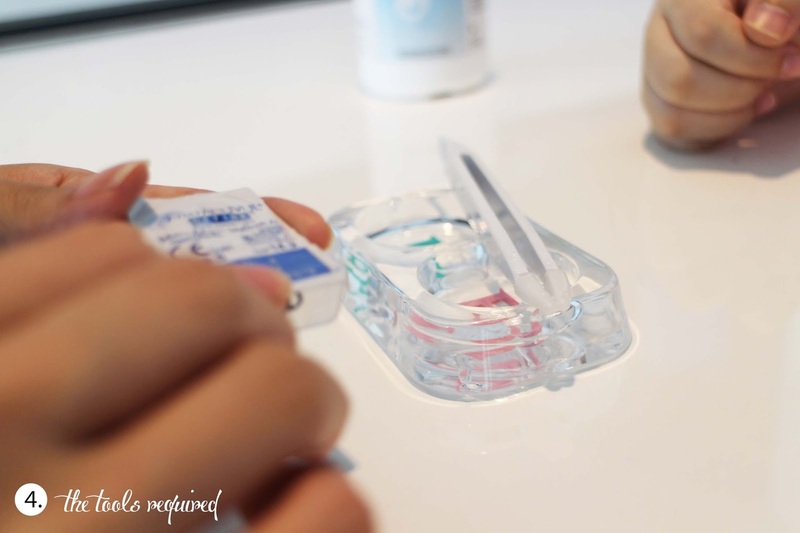 We will take you through a regular fitting for contact lenses to give first time contact lens users an insight as to what goes on. 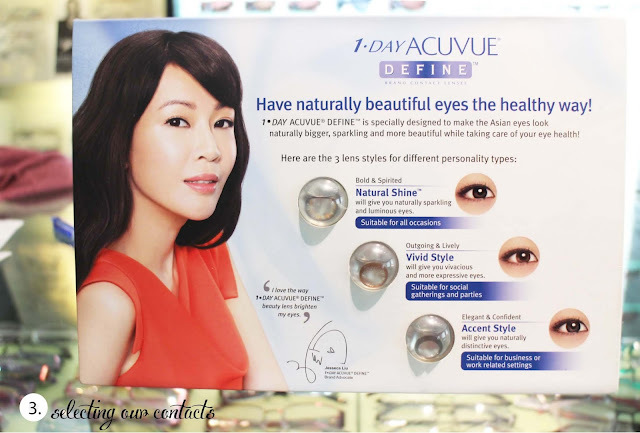 Don't forget to read part one which will give you more information about the 1-Day Acuvue Define lenses. First up was a simple retinal scan just do to the basic needs of checking the shape of our eyes etc. 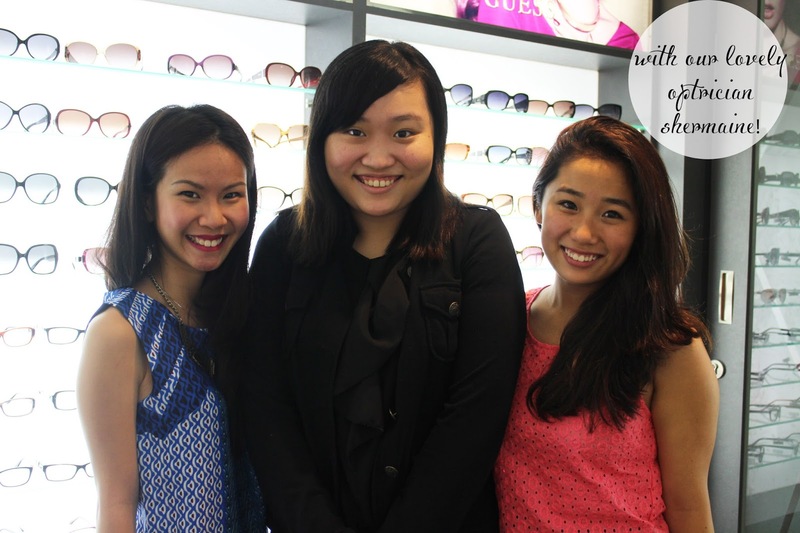 How chic do we look in our new glasses? The lighting in the room was a little dim and I had left my flash add-on to my camera at home so I'm terribly sorry if the photos are just a tad dark. Anywho, I'm sure most of you have done a basic eye test before and this was used to determine our degrees to our eyesight. Our results were that we both have a slight degree but was not strong enough for our contacts to carry one. Hence we were issued the contacts without a degree. 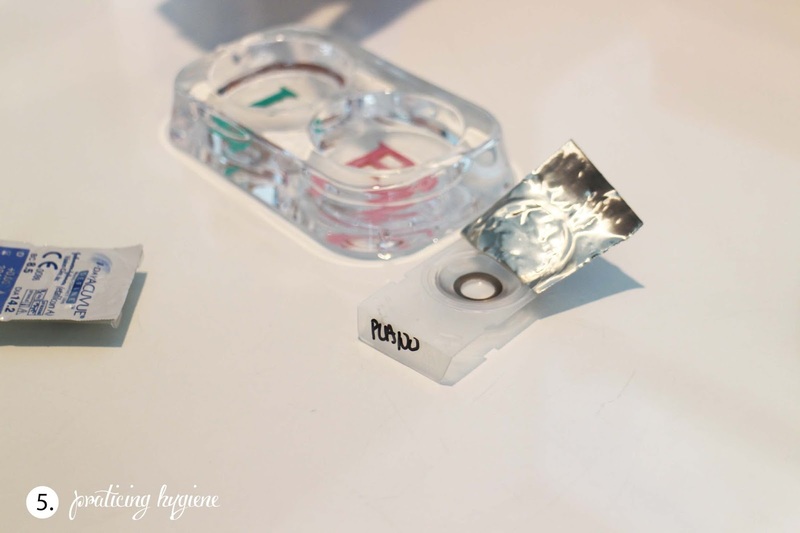 These are the three types of lenses that we got to pick from, to read more about the difference between the three with specific details and measurements regarding diameter size click here. 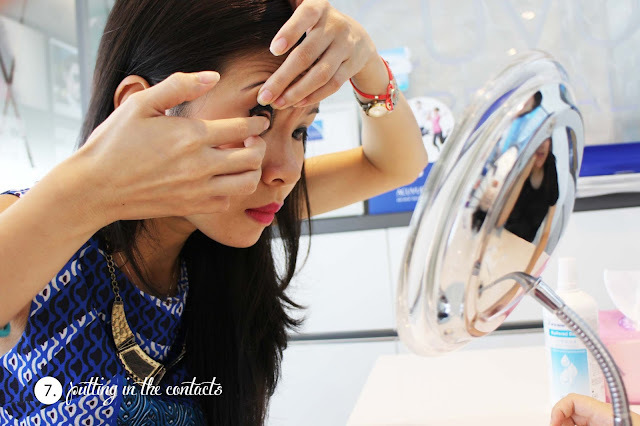 Now of course we had already washed our hands right before this started, (they have a wash basin for you at Eyechamp) , the area in which you apply your contacts should be clean in case your contacts fall out onto the surface. We then had a go a putting the contacts in! I definitely have to give props to sam for getting the contact in really quickly - believe it or not it took me a probably 30 mins to have the courage to put a contact in a year ago! 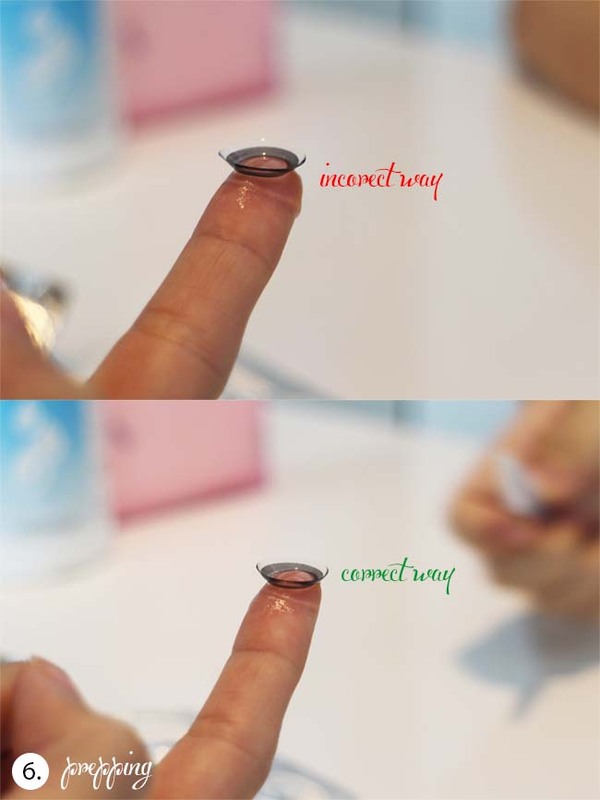 Basically you want to place the contact on ur index finger and sort of "open" your eyes with both middle fingers as you can see in the photograph! 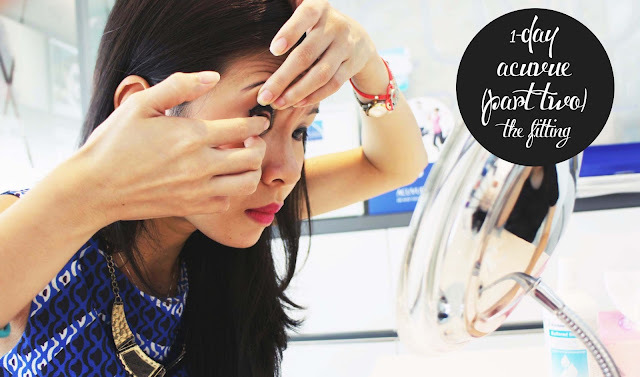 Another tip is not having really long nails in fear that it might scratch the contacts or even your eye. After putting the contacts in, we were to have it in for about 5 - 10 minutes to let the contacts sit and to see how we feel about them. Here's sam looking lovely as always whilst her contacts are in! Ps, don't you just love the lip colour she's rocking? 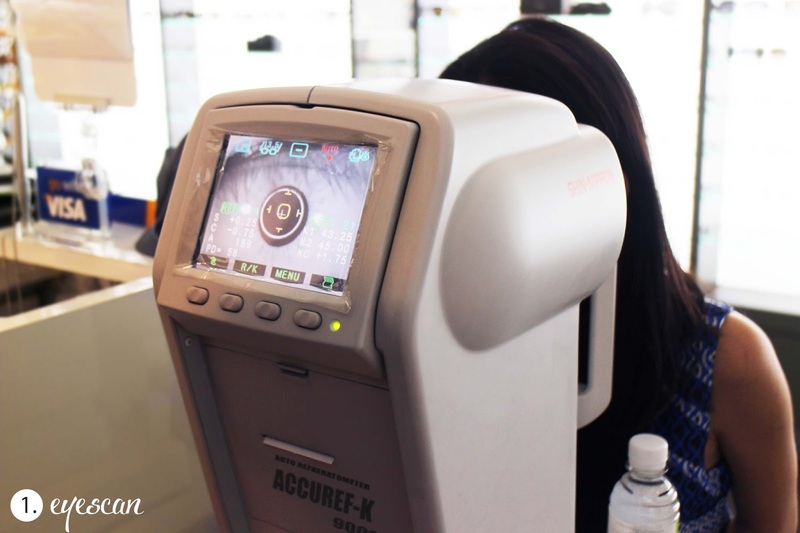 Once its set for about 10 minutes, Shermaine did another eyescan where she would look through the lens to see how the contacts fit on our pupil. 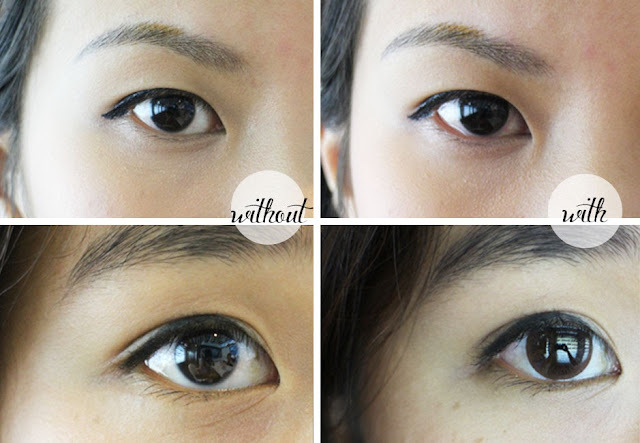 These are our before and after photographs with the lenses on! Sam has the Accent style lens on where as I have the Vivid Style lens on, can you spot the difference? 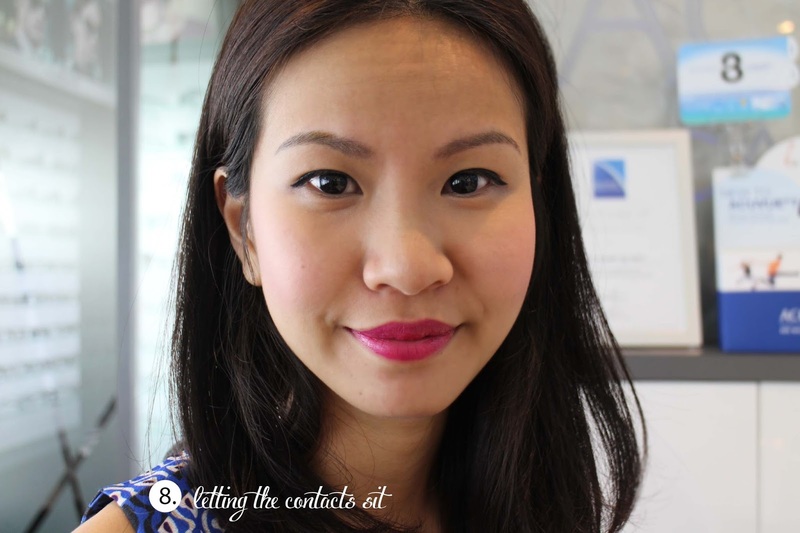 The contacts look extremely natural and we definitely are looking forward to trying the 7-day kit very soon! 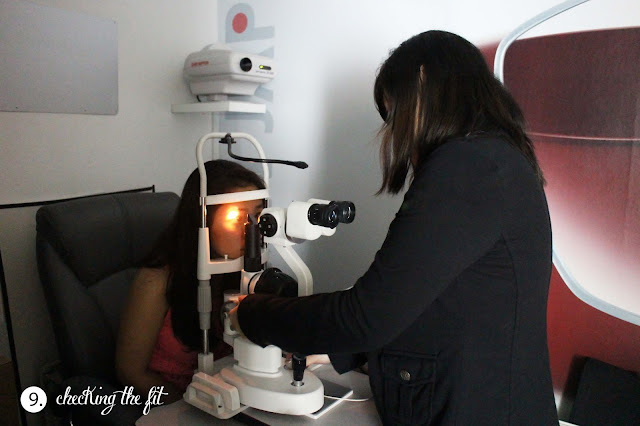 Our optician Shermaine was really nice and the overall process was enjoyable, we've definitely gained more insight to the simple steps taken to apply contact lenses. We are currently awaiting the arrival of our contact lenses to do a full review for you guys.